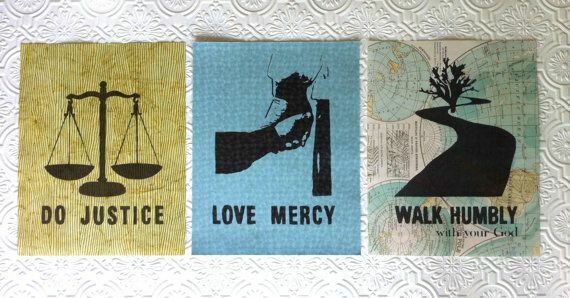 Do Justice, Love Mercy, Walk Humbly…. –Micah 6:8 (English Standard Version). Pastor Gary talked about the verse above one Sunday morning in his sermon. He brought it back to my mind and made me really consider it. I can’t tell you how many times I’ve read this verse or sung it as either a Cantor in the Catholic Church or as a worship leader in protestant churches, but for some reason it never clicked with me. The more I thought about it, the more I wanted to write about it. The more I wanted to write about it, I started thinking about other verses that either were favorites of mine or some that maybe I hadn’t really noticed before. So I’ve decided that I’ll do some entries about verses in both of those categories and call it “Little Gems.” This is the first of those entries. The Book of Micah is one of those “out of the way” books in the Bible. As one of the 12 books of the minor prophets, it doesn’t get the consideration the major prophetical books like Isaiah, Ezekiel, or Daniel do. It also isn’t one of the big weighty books like Leviticus. It’s a pity, because Micah has a lot to say about what today we would call “social justice.” Perhaps that’s why it doesn’t get much play in conservative evangelical circles. Then we get to verse 8. The prophet says “Hey, God has told you what is good before, What more does he want of you but to do justice, love kindness, and walk humbly with him?” To me, this is the message of Christianity, the message of Jesus in a nutshell. Let’s take just a moment to consider these things. God wants us to do economic justice. He wants us to seek to end the way people lord and horde countless riches while so many others can’t even get by. He wants people to get paid fairly for the work they do. The second thing is to “love kindness” or some translations have it as “love mercy.” This is every bit as subversive as the first idea. Kindness and mercy equal forgiveness. They equal respect for everyone despite their circumstances. They equal second chances for everyone, whether they deserve it or not. This is another radical concept in today’s world. Christianity seems to stand for judgment and sin avoidance. So many of us love to preach about “God’s Law” at other people without realizing that none of us measure up either. Showing kindness and mercy toward those who might have committed an offense against us, or what we perceive to be an offense to our beliefs is difficult, but it is an absolutely essential element of Christianity. How easily we forget that. Finally the prophet says that we are to walk humbly with our God. Think about the literal act of walking with someone and imagine walking humbly with them. You’re talking to them, listening to them, interacting with them. If you’re walking humbly, chances are you’re not walking around with your chest puffed out trying to get people to look at you. I mean, hey, you’re walking with God! You’re a super Christian. You don’t smoke, drink, swear, watch rated R movies or date girls who do! Walking humbly means being quiet and, well HUMBLE. It doesn’t mean walking by other folks and shouting at them, thumping them over the head with the Bible because you think that they’re doing something wrong. When we do these things: seek justice, love kindness, and walk humbly with God, we become an example to others. We show what walking with Jesus can really bring about in one’s life. We show that despite the trappings of modern Christianity, there are people out there who are dedicated to bringing the justice, mercy, and humility of the God who became man in a stable into the world and try to make it a better place for everyone. It’s worth trying. I know it is.